Colossal Fruit Basket. Wonderfully displayed in a handsome basket, our Colossal Fruit Basket contains the most luscious domestic and tropical fruits available. Fruits may include apples, oranges, grapes, kiwi, pears, nectarines, bananas, pineapple, and coconut as available. A great gift for any occasion. Exact basket and fruit selection may vary by season and delivery location. Deluxe basket is shown. 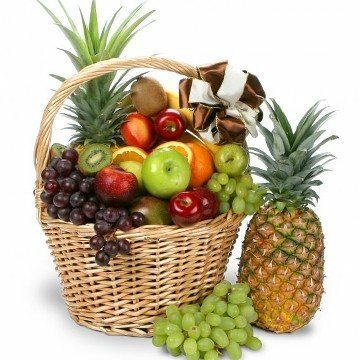 Colossal Fruit Basket has been purchased most frequently by our customers for the following occasions: Sympathy, Get Well, Thank You, Christmas, and Birthday.